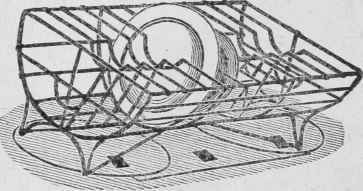 - The engraving represents a dish-warmer made of wire with feet so arranged that it may be set on a stove. Nothing spoils a good breakfast or dinner so effectually as cold plates, but when placed in the oven to heat they are very likely to be left too long, and get too hot, or if fine wares, are ruined by over-heating. With this heater there is no danger of over-heating, or injury. 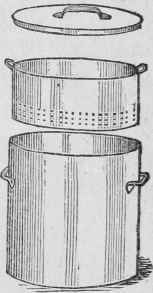 This may also be used as a dish-drainer, and is equal to the best made specially for the purpose. 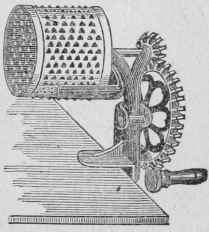 Revolving Grater - This is a labor-saving grater, for grating horse-radish, cocoanut, pumpkin, and such other articles as need treatment on a coarse grater. It is fastened to a strong frame which is sore wed to a table, and as will be readily seen, does its work with great rapidity. When much work of this kind is clone in a family, it pays for itself in a few months in the saving of time, and yet it is so simple and so well constructed that it will last a life-time. This is as great an improvement in its way as the modern egg-beater is over a spoon. The" world moves," and even in the kitchen labor is lightened by the ingenuity of modern invention. A Good Lantern is a necessity in every house, and a poor lantern that is always out of order when wanted, is as much a nuisance as a broken umbrella, The form represented here burns kerosene oil, and is a cheap, convenient, and in every way a good lantern for family use. The lamp is easily filled. The tube that surrounds the lamp furnishes the air for combustion and it is not easily broken or damaged.